I have a lot of things to share, so I’m combining them all in an EZ to read post. 1. I still don’t have my autopsy results, so please continue to worry. In related news, biopsy spot on my back has to be bacitracined and band aided and since Husbandrinka was out of town, this task fell to my daughter. Which she did admirably. She even used a bacon band-aid, which made me feel super fashionable and Lady Gagaesque. Bacon band-aid on my freckled biopsied back. Photo by my 12 year old daughter, who said, You know I have homework, right? when I asked her to photograph it. I was super nervous that by “try to help” they meant “maim and dismember” but I’m sure that you’ll agree that it was worth taking the risk if it meant getting WiFi faster. So I did it. I gave them my account info, and my address, but don’t worry, to ensure safety, I told them that we lived there with armed guards and attack dogs. Of course I ran this plan by Husbandrinka and he said “sure, why not?” with the careless demeanor of someone who was going to be in D.C. for most of the week and therefore was immune from the Time Warner massacre. The good news is that the technician that they sent was apparently too drained to actually go on a rampage, so he settled for just fixing our WiFi and that was that. Thanks, Time Warner! 3. On Friday, I woke up with terrible shoulder pain. I quickly did some internet searches and learned that it was a sign of aging, and possibly death. But I’m sorry to say that Husbandrinka is not the man we thought he was in terms of taking care of me during my ailment. For example, as I was silently sobbing because of the pain in the middle of the night, he got up and put in ear plugs so that he could continue to sleep, uninterrupted. When I confronted him about that, he pointed out that if I’d been sobbing silently, he wouldn’t have to put in ear plugs. 4. Now I no longer have shoulder pain. It’s a miracle. What kind of pain will I wake up with next? 5. Mama paid me a huge compliment and told me that I look like I’ve lost weight. What she actually said, “you used to look like you were eight months pregnant and I was concerned and now you look like you had abortion or partial birth.” I’m pretty sure that Hallmark is going to recruit her soon. 6. I recently finished a book that I adored more than any other book that I’ve read this year. And that’s saying something, because it’s late September already. And now I’m upset that it’s over. It’s Half Baked: The Story of My Nerves, My Newborn, and How We Both Learned to Breathe by Alexa Stevenson and you must read it. It’s an amazing story and Alexa is the type of writer that I dream of plagiarizing. 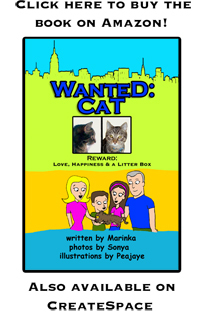 If you like this blog, you’ll love her book. Her humor is irreverent and important and the story, about her her daughter’s birth, fifteen weeks early, is like nothing that I’ve read before. Half Baked is about many things–infertility, pregnancy, loss, premature babies, but ultimately it’s about the love that parents feel for their children and a little about the terror of being a parent. Read Half Baked: The Story of My Nerves, My Newborn, and How We Both Learned to Breathe You’ll thank me. 7. I’m over at The Mouthy Housewives today. And for once, I’m advising against taking the high road. Don’t forget to enter 8th Continent Soymilk‘s Nice Job, Mom contest! Share your “less than perfect” parenting story and you can win a fantastic prize! Good luck! love your mama. she always knows the right words to say. take care, marinka. Ha! Your Mama sounds hysterical! Thanks for scaring the crap out of me with your bacon band-aid. I thought that was a picture BEFORE THE BIOPSY. You thought I grew bacon on my back?! Are you calling me a pig? This is a fine “how do you do.” A fine one. I feel the same as Ann. It looks worse than the crap being biopsied off MY body. Is it even Kosher for you to walk around with a bacon band aid? Do dogs try to lick your back? Is that why you did it? thanks for the book recc! Disturbing bacon picture! I too was afraid that was pre-biopsy and was wondering why the doc was only concerned after you told him it itched. Either that or it was new swine flu symptom…lord know what THAT would do to your hypochondriac self! looking forward to good news tomorrow. I love the bacon band-aid and I am keeping you in my prayers. Bacon band aids? Now I know what to get for my husband’s stocking. Or one of his Chanukah gifts. Now THAT would be perfect. Mama cracks me up. You crack me up. That book sounds amazing and I’ll definitely look into it. Thanks for the tip! I’ll pick up the book but I’m not strong enough right now to read any writers who are better than I am. Do you have any recs for crappy books that will make me feel better about my own lack of talent? Of course, coming here and reading your literary genius didn’t do me any favors, either. I might have to swear off the internet forever, the way a teen girl is “never ever leaving her room ever again!” This is me, slamming the door on the world wide web. Oh, I totally agree. It was really insensitive of Alexa to write so well. Thank god for Jodi Picault. The writer you’d most like to plagiarize….Love that. I have that book on my list. I adore Alexa’s blog. I just haven’t managed to buy the book yet. Well, I HAD spent the whole weekend worrying about you. But now that I know you have bacon bandaids, I’m not worrying any more. Bacon cures almost anything. So….what is the BX result? Great. Now I’m hungry. First the bacon, then the Half-Baked reference, which made me think of Baked Beans. I’m glad you don’t have cancer, but really, it was pretty selfish of you to post pictures of bacon. Even if it was of a one-dimensional plastic-y sterile type. Do you not care about your fans at all?! Great. Now I’m hungry. First the bacon, then the Half-Baked reference, which made me think of Baked Beans. I’m glad you don’t have cancer, but really, it was pretty selfish of you to post pictures of bacon. Even if it was of a one-dimensional plastic-y sterile type. I’m starving over here! Do you not care about your fans at all?! For example, as I was silently sobbing because of the pain in the middle of the night, he got up and put in ear plugs so that he could continue to sleep, uninterrupted. When I confronted him about that, he pointed out that if I’d been sobbing silently, he wouldn’t have to put in ear plugs. YOU are the type of writer I dream of plagarizing! I love the bacon band-aid! How stylish and yummy! I hope you’re okay. I had a suspicious mole removed from my back a few months ago. I was worried until I got the results back, and for now, I’m okay. I have to check out that book you suggested. Thanks. 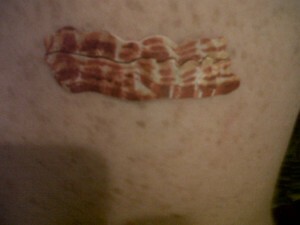 How have I not known about bacon bandaids? I seriously want them now…and maybe some real bacon too.